Poetry bonanza Monday: Niamh’s challenge for you and an invite from me! 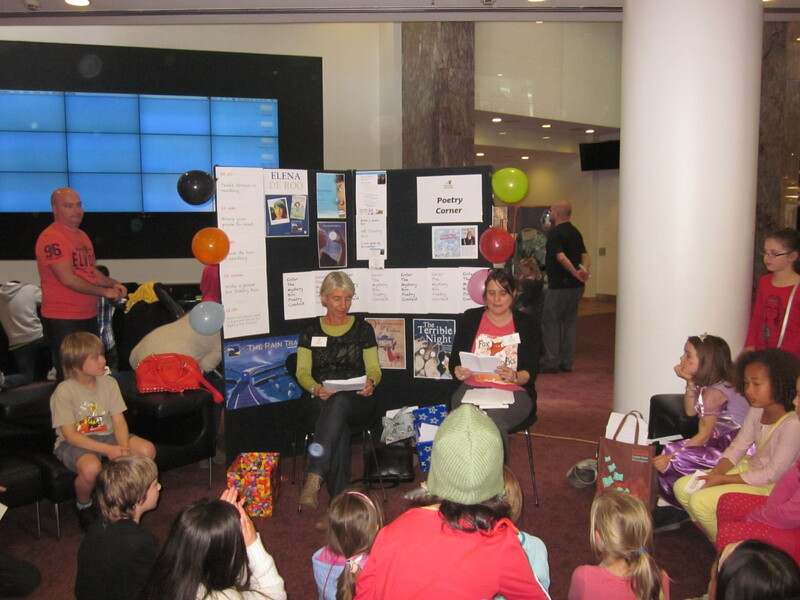 On Sunday it is Storylines Family Day in Auckland. Last week I invited you to come up with a challenge. Thanks for sending in so many good ideas. I have picked challenges that Niamh sent in. 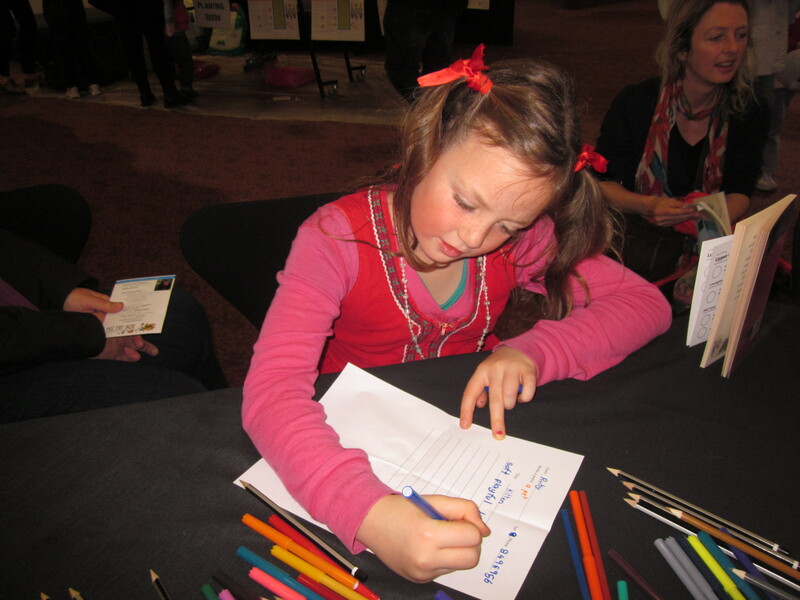 She is aged 11 and goes to Selwyn House School in Christchurch. She sent in four challenges and I picked two to share. I loved these and want to try them too! I will send Niamh a copy of The Letterbox Cat as a thank you. I also especially loved Maddie’s challenge and might use her’s another time. Paula’s tip: give your poem a sound check before you send it. PLEASE say it’s for the Niamh’s-Poem challenge. Put in the subject line of the email please. 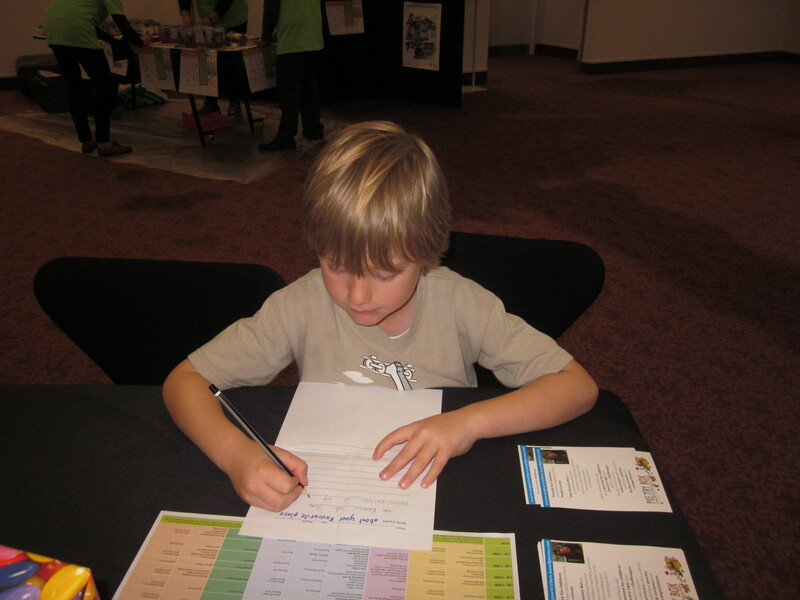 This entry was posted in NZ Author, NZ children's book, NZ Children's poetry, Poetry and tagged Poetry challenge, Storylines Family Day on August 24, 2015 by Paula Green. I thought I would post the two poems that won the Bring a Poem to Read competition at Storylines. This was Ruby’s. She is in Year 5 and goes to Oratia Primary School. She read it beautifully. I thought her poem had great movement. the last chance to make it. This was Esther’s first poem. She is 6 and goes to Churchill Park School. 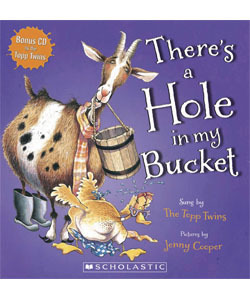 It sounded really fun read aloud. This entry was posted in Poetry and tagged Storylines Family Day on August 25, 2013 by Paula Green. Ruby won the senior Bring a Poem to Read (see my last post) and Esther won the junior poem. 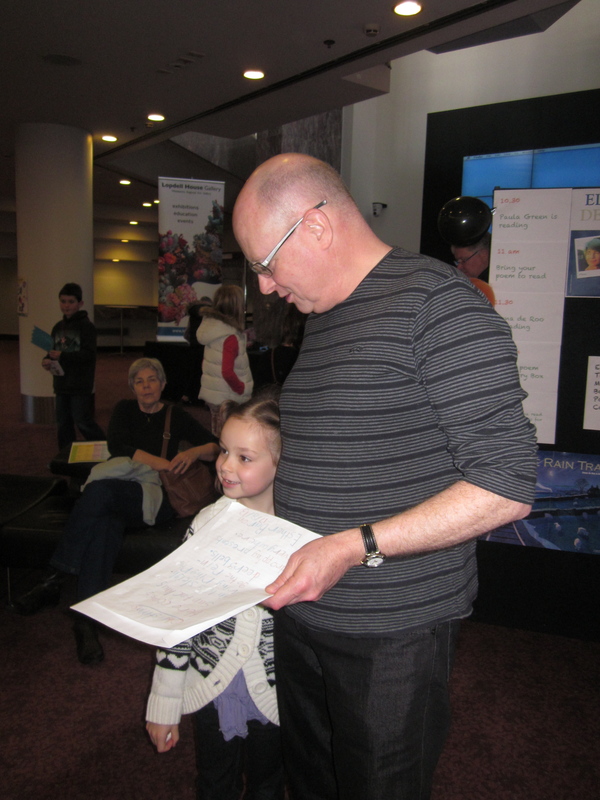 Esther’s dad said it was the first poem she has written so that was pretty special. She is Year 1. Here is a photo of her with her dad. These were some of our favourite poems in the Junior section of the Mystery Box Poem Competition. but it’s made of rock. bright in the black, night sky. And finally Harry’s (6) poem that made me laugh too! 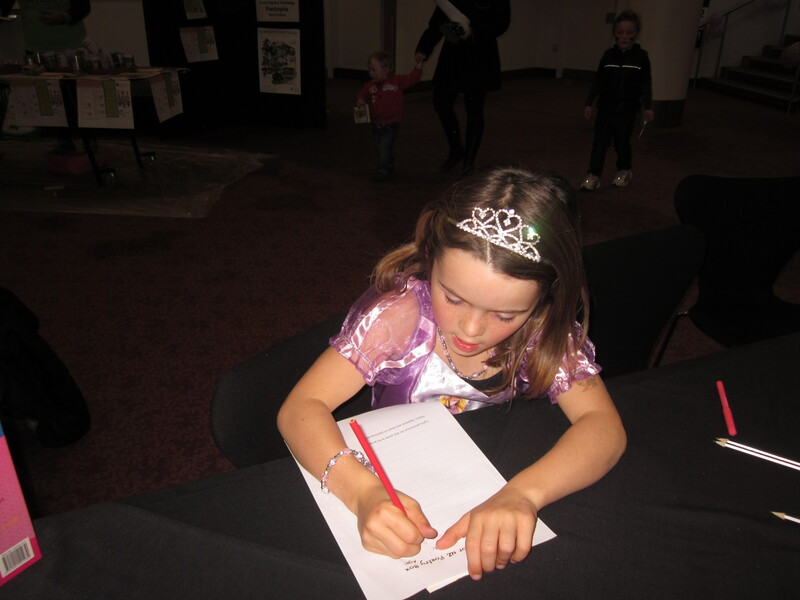 This entry was posted in Poetry and tagged poems by children, Storylines Family Day on August 21, 2013 by Paula Green. 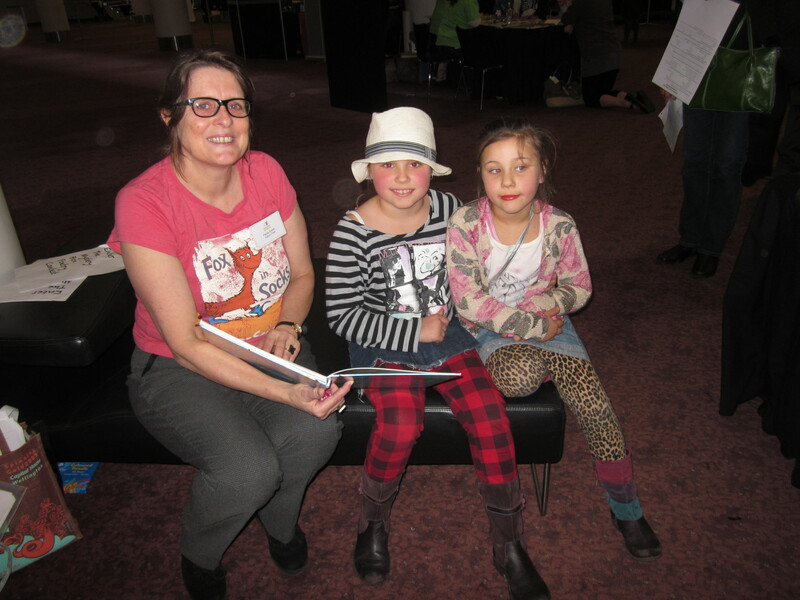 Lots of children came and joined in the fun at the Poetry Corner at the Storylines Family Day in Auckland. Elena and I were so busy we didn’t get a change to hear any of the other authors but it was great to have lots of hugs with all my favourite writers. Here are some of the winners and favourite poems in the senior section (8 to 12 years). Ruby (aged 8) was one of the winners of the Senior section. She has used great detail and I do like the ending! Mira (10) was a winner with this poem. She had to write about something cold. I like the ending as it put a smile on my face and she has picked some delicious words. The snow is no place to get a good tan. I also liked this Ruby’s (9) poem about her favourite food. Watch out for the ending! Unfortunately she didn’t get to hear me read it out but everyone loved it. But she won the bring a poem to read competition. Here she is with her sister Ava. my mum slept in while I made lunch. Beads of sweat stain my forehead. Travis (12) wrote this poem that I loved. Simple poems can say a lot! It’s a starry, starry night. 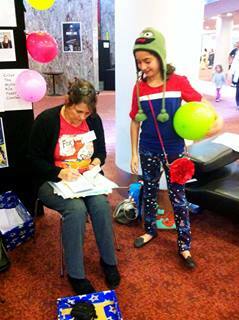 Elena de Roo and I are hoping to see you in our Poetry Corner at the Storylines Family Day in Auckland tomorrow. 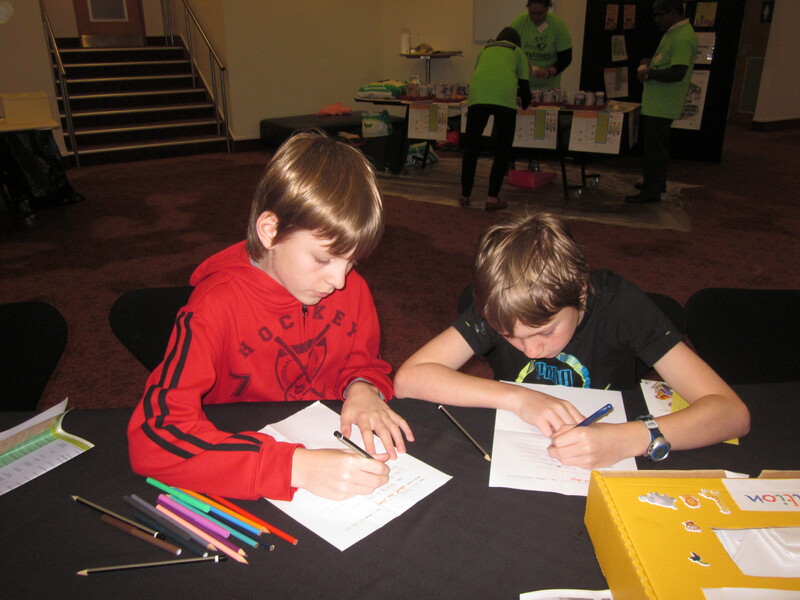 It is at the Aotea Centre. Do bring a poem to read at 11 o’clock. And you can come and write a poem for the Mystery Box Poem Competition. I will be reading some poems at 10.30 and with Elena at 12.30. 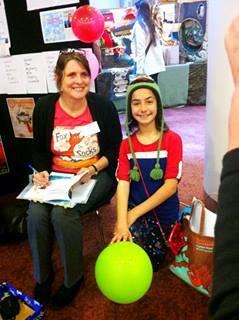 It should be a great day with lots of New Zealand children’s authors buzzing about doing gret things. This entry was posted in Poetry and tagged Storylines Family Day on August 17, 2013 by Paula Green. 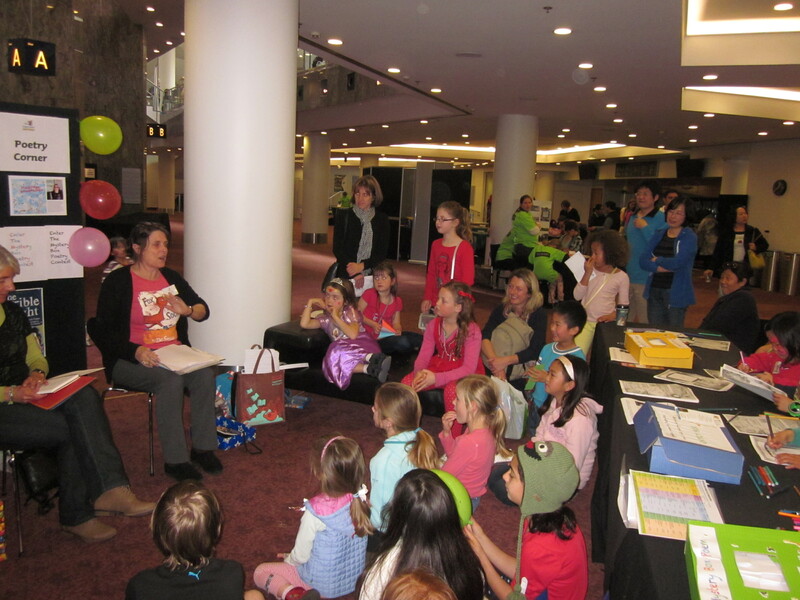 Due to today’s earthquake The Storylines Family Day in Wellington is cancelled. Do pass the message on. This entry was posted in Uncategorized and tagged Storylines Family Day on August 16, 2013 by Paula Green.